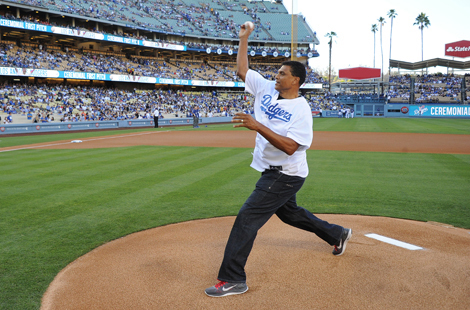 CSUN men’s basketball coach Reggie Theus threw out the ceremonial first pitch in front of a sold-out crowd at Dodger Stadium in celebration of CSUN Alumni Night on Aug. 16. Read more about CSUN Alumni Night. MONEY magazine has named CSUN a Top 10 “Value All Star” on its list of the U.S. colleges and universities that “add the most value” in its recently released Best Colleges rankings. Read more about the ranking. Children of all ages and backgrounds learned, played and made memories at CSUN this summer. Read more about summer programs. Sat., Aug. 30, 5:30 p.m. Thu., Sept. 18, 7:30 p.m. Legendary comic brings hilarious show to CSUN. Uncover the power of the hashtag, learn the tricks and tips to grow your Twitter following, share relevant Tweets and more in this live online webinar from the Alumni Association. CSUN kinesiology students will expand the 100 Citizens program to three new cities, encouraging people to make healthy community transformations through exercise and healthy living. Starting this fall, CSUN’s Department of Pan African Studies officially will be renamed the Department of Africana Studies to better reflect the field.